Get Started — Foley Prep | Train hard. Test easy. All tutoring takes place in one of our Foley Prep Hubs or if you prefer, online, or a combination of both. Our offices provide a comfortable escape in which we keep a collaborative camaraderie among our faculty to deliver the highest value experience to our students. 50% and 71%. Those statistics speak volumes about us. We have grown 50% each year since 2013. Of our 1-on-1 and class package holders, 71% renewed for 2 or more packages. Most students prep for at least 2 ACTs and/or SATs over the course of several months to a year. No matter what point you are on the educational timeline, start by calling us. Ron will help you make a plan. Call 732-412-1416 today. Most students start out as either tutoring or class students and plan to be with us over the course of several months. Tutoring students are welcome to sit for classes; class students usually pepper in private tutoring sessions as they progress through the program. No two students take the exact same path through Foley Prep. All private tutoring takes place in one of our hubs or online - whichever is simplest for you. Our tutors are in demand and time is limited, so the earlier you book, the more likely you will get the time you want. Call us to make a plan 732-412-1416. For SAT and ACT prepsters, sign up for a free a practice test to establish a baseline score. This step is optional, but helpful for us to start seeing individual strengths and weaknesses. Come to regular appointments once or twice a week for a few months. Continually take practice tests to motivate progress. It's possible to combine classes and tutoring into a package. It's also possible to start with classes and switch to tutoring. In addition to Mandarin Chinese, Biology, Chemistry, and Physics, we have 6 active Calculus tutors through the AP level and beyond. Just call us to ask if you are wondering what subjects we offer. We are working on the online booking system, for now we book via email, phone, and text. All tutoring takes place in our hubs or online (if you wish). We pair students up with tutors who will be in for the long haul (unless a change is requested). Foley Prep Pros act as a team, we may suggest a change in tutors, or you may wish to change tutors. We put students at the center of this experience, not ourselves. We do not ask our tutors to stretch beyond their areas of expertise - AP Calculus teachers know how to teach AP Calculus, for instance. Our hubs have classes 6 days a week. 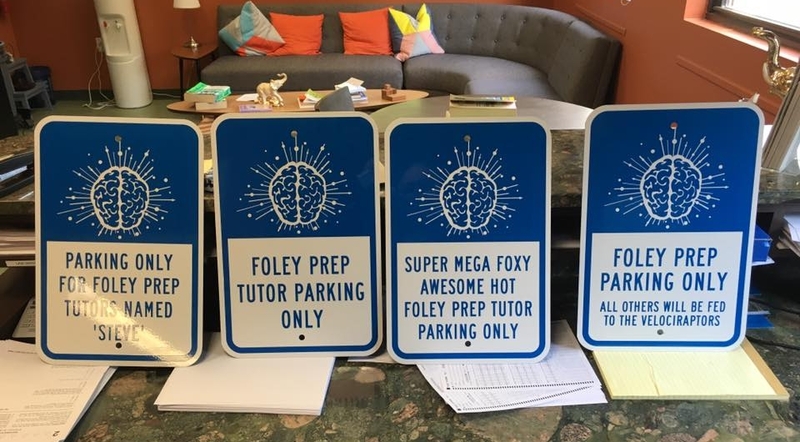 Foley Prep is a closely held, owner-operated business so you are free to take classes at whichever hub you like - you are free to move between hubs as often as you like. For more details on how our program works, go to our SAT ACT Class Info Page. You don't have to follow these steps in order. Take your time, then contact us. Call us to make a plan 732-412-1416. We won't give you a sales pitch. We will give you the best advice on how to use our program and some tips about which test to take (ACT or SAT? Both?) and a plan for the year. If you are a mobile user, please download the Foley Prep App, Or view the complete schedule on the booking site. Everyone is welcome to sign up and take 2 free, full-length practice tests before joining our program. Most prepsters start with a practice test to establish a baseline score, but it's okay to start by taking a class. "Open" classes are designed to be taken as many times as possible and as a first class, but you are welcome to start with any class on our schedule. Content and strategies are introduced and reinforced in each class. View and purchase a package or buy an individual class. This gets you access to our online reservation system. Please book classes at least 24 hours in advance so that we can design the best experience for your child. We ask that students register at least 24 hours in advance so we can personalize each lesson. There are no penalties for "dropping in" or "dropping out" of a particular class just before it happens. Our Continuous Class Program is designed so that students can start anytime, pause, and continue. There is no particular order to the classes. Each class is meant to be a standalone experience. Registering 24 hours in advance for class gives our Foley Prep Pros time to personalize each lesson by looking into each prepster's test records and notes we keep to ensure progress. Because the SAT and ACT have a lot of overlap in content, it makes the most sense to prep for one test, but plan to take both tests soon after you've prepped. We recommend at least 10 classes between taking the actual tests. We recommend taking a Foley Prep practice test every 3-4 or so classes. Think of them as motivational homework, not just measurement. Don't expect immediate, linear gains, rather, focus on integrating Foley Prep teachings to become a better problem-solver. Tutoring is a concierge educational choice that is a great option for many. We pair students with a Foley Prep Pro for the long haul and will change tutors only at the request of the student or parent. Our Foley Prep Pro team puts your child's improvement at the center of the process. Foley Prep classes cater to the most discriminating clients, but sometimes private tutoring is the only way to go. If a student comes to us in the high or low ends score-wise, we often ask that they go right into tutoring. That means students scoring 1400 SAT or 30 ACT or higher and below 1100 SAT and 22 ACT. After a time, we may suggest classes that are suitable, but very-fine tuned prep is the way to start. Call anytime to discuss a plan with me, Ron Foley. I talk with moms, students, and fellow educators all day long. 732-412-1416.